Thanks Dan – it is a pleasure working with you, especially since we all like golf. 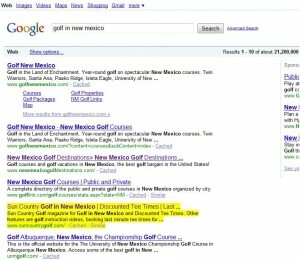 Here is an example of what we did with one of the keyword phrases (Golf in New Mexico) that we determined would bring some traffic. It’s rewarding to see you ranked at # 5 on page one of Google out of over 21 million results. 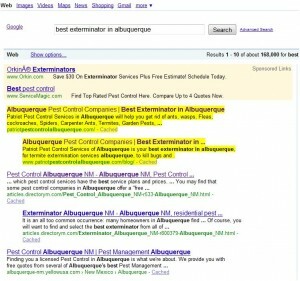 “When we decided to start our new pest control business in Albuquerque, we did some research and immediately realized that we needed an internet presence to attract more customers and improve our success rate. We hired 505 Internet Marketing Services and are so happy we did. Within a short period of time they were able to build us a custom website from scratch, establish an online marketing blueprint that enabled them to utilize their proven step-by-step system incorporating best practices that optimizes our site for first-rate search engine results. Now we are getting a steady flow of traffic resulting in a client base that continues to grow. Well Chris it is certainly our pleasure and quite a good feeling seeing your website listed at the very top of Page One of Google. Since you are the Best Exterminator in Albuquerque you should be found accordingly and now you have Two (2) of the top Five (5) positions! 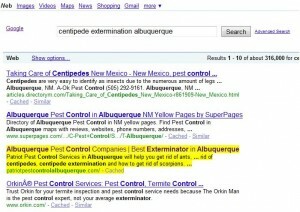 Plus we just recently got this one onto page one of Google for Centipede Extermination Albuquerque. We are happy to report that you are now listed ahead of Orkin. We could go on and on Chris but when you asked us to get your site ranked for the incredible new Pest Insulation product you have available to your commercial and residential customers, we got you the 2nd and 3rd spots on Page One of Google (out of almost 2 million competing sites). All weekend I was frustrated with the bad permalinks on my WordPress blog. I kept getting 404 error every time I clicked the links. I was on every blog site and forum trying to fix the problem to no avail. One night I stayed up until 1:30 in the morning only to have to uninstall my blog the next morning because I messed up one of my sub directories so bad. As soon as I talked to Steve and 505 Internet Marketing Services, the problem with permalinks was easily explained to me and fixed within about 5 minutes. Why didn’t I call you guys sooner? Thanks and Keep up the great work! I couldn’t be more pleased with the recent service from 505 Internet Marketing Services. The information provided and the speed and quality of service including follow up was extraordinary. The work they did for my Financial Membership Site was exceptional and I highly recommend their web desion, marketing, and SEO services to anyone. I’m sure this will be a long business relationship!